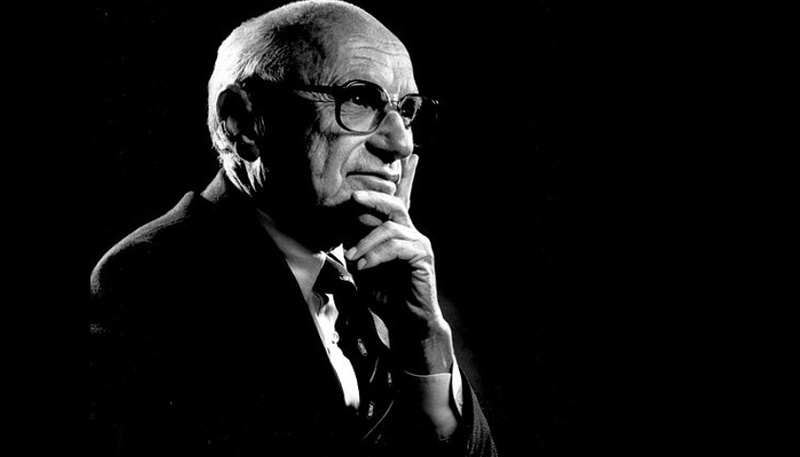 Milton Friedman is probably the most important free-market thinker of the twentieth century. His ideas in defense of capitalism and economic freedom had an enormous influence on the shift towards free-market policies that took place from the 1970s onwards. Countries like the UK, China, Chile, or Estonia followed the economic recipes contained in best sellers like Free to Choose or Capitalism and Freedom, unleashing the power of free markets to create wealth and prosperity. Yet the contributions of Friedman as an economist are often overlooked by non-economists. Here are three that will help you understand a bit better his work. In 1953, Friedman wrote a very influential essay titled The Methodology of Positive Economics, where he puts forward what he thinks is the right methodological approach to economics. According to Friedman, the assumptions on which a theory rests don’t have to be realistic: as long as they are “sufficiently good approximations for the purpose in hand” (which is to make accurate predictions), the theory is valid and useful to analyze the world. Let’s draw upon an example to better understand what he meant. We are all familiar with the theory of perfect competition, which is based on a series of assumptions that have been criticized by many authors (e.g. by Hayek) for being unrealistic: homogenous products, perfect knowledge, freedom of entry and exit etc. For Friedman, the fact that these assumptions don’t reflect the real functioning of markets is irrelevant. Perfect competition is, as he puts it, “an engine to analyze it [the world], not a photographic reproduction of it.” What really matters is that this engine produces accurate predictions, not that the assumptions are realistic. Friedman collaborated with Anna Schwarz to publish in 1963 A Monetary History of the United States, an analysis of how monetary policy affected business cycles in the US between 1867 and 1969. Their main finding is that that changes in the money supply are closely linked to recessions and depressions as well as inflationary and deflationary episodes. This idea finds support, for instance, in the empirical analysis undertaken by Schwarz and Friedman of The Great Depression. The authors argue that the Federal Reserve failed to prevent the sharp drop in the money supply between 1930 and 1933 (many banks went bankrupt due to runs), which resulted in the Great Depression. What should the goal of firms be in market societies? This question has engaged many academics over the last decades. The traditional view was brilliantly formulated by Friedman in a 1970 article. According to Friedman, “there is one and only one social responsibility of business–to use its resources and engage in activities designed to increase its profits so long as it stays within the rules of the game, which is to say, engages in open and free competition without deception or fraud” (emphasis mine; some critics tend to omit this second part of the statement when quoting Friedman). Since then, other theories have emerged to dispute the idea that businesses should solely focus on increasing profits with the aim of creating value for shareholders. However, Friedman’s conception of the objective of the firm is still the lighthouse that guides businesses all over the world.